At 4:00 on Saturday we all headed over to rehearse for the big day! Mr. Rusty married them so it was neat to have him there with us. He married us too (it was his first time!) and I joked with him when Danielle told me she got engaged that she immediately said she wants Rusty to do the wedding haha. It was fun getting to practice everything and for Chrissy to get to use her bow bouquet we made her from her showers! Brandon and Chrissy had their ceremony at The Pena Peck Women’s Exchange in old town in St. Augustine! Very unique as I’m sure all of you thought “St Augustine must mean the beach!” I love that they did something different and it was a very pretty spot for sure! It was neat because after we finished practicing we just walked down to Harry’s where Mom planned the Rehearsal Dinner! The rehearsal dinner was nice as it gave us a chance to mingle with other people in the wedding party. I first met Cassandra back at Chrissy’s graduation from UF and she was the Maid of Honor. I clicked with her right away as Kye was a little over 2 months old I think and she was still pregnant at the time with Gavin! She actually read the blog and has followed Babywise! AND she breastfed for a long time too! We have so much in common in our parenting styles and just overall personalities. I’ve only actually seen her three times (including the weekend of the wedding) which just doesn’t seem possible. I feel like we were bffs in a past life or something b/c I feel like I know her so well! I really wish we lived closer (she lives close to Tampa) as I’d LOVE to spend more time together and for Gavin and Kye to be good friends! Kye and Gavin – they are 5 months apart in age to the day! If you didn’t notice already, I didn’t actually see Kye much over the weekend! It worked out GREAT that Mr. Rusty did the ceremony (or “Father Rusty” as Liz kept calling him haha) as that meant Mrs. Charlotte got to come down for the weekend too. She and Mr. Rusty volunteered to help take care of Kye so Zach and I could keep our focus on the wedding. I’m more thankful for that than I can even express. They were AMAZING and did such a great job helping out. 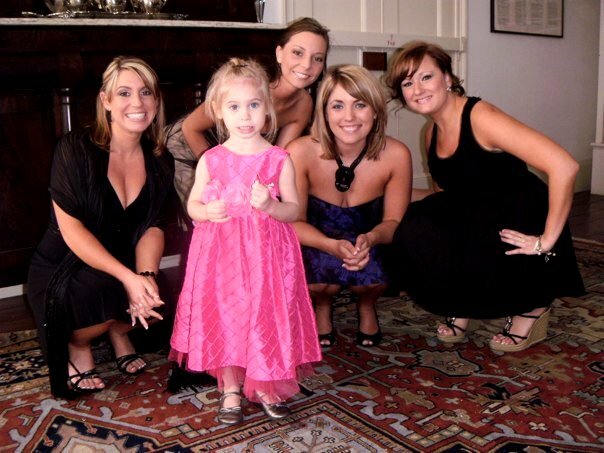 I seriously didn’t have to worry about a thing, just being a bridesmaid! I feel like they are some of those people I really bonded with over the weekend. I feel SO much closer to them both than I’ve ever felt! Everyone kept telling me how lucky I am to have them for in-laws and how not too many people would come on vacation to St Augustine and spend their whole trip babysitting. Trust me, I agree and I AM so lucky 🙂 They kept him right on schedule and everything! While he looks cute in the pics, Kye was probably the fussiest at the rehearsal dinner. It was bad for him at least. He started having a lot of snot (like it was a RIVER pouring from his nose) the day we left and I think it’s a teething issue. GREAT timing right? At least we had a lot of people to help keep him busy and happy! Next Up: THE BIG DAY!!!! Next Post Wedding Weekend: Gettin’ Ready! OMG!! Dang girl, you look GOOOOODDD!!! Your tummy is so flat, & that rockin' purple dress looks smokin' on you! I hope you're proud of yourself- you look AWESOME! WOW!! Mrs. Charlotte is really sweet, and I can picture her taking her job so seriously watching him and sticking to his routine, she is such a sweet heart ;)And btw, I am so glad that you look this good, it gives me encouragement for my future body some day after my 14 children, lol!